Tulsa mayoral candidate Paul Tay will not "step off," calls out "Matt Damon." Don't be telling me local politics are boring. 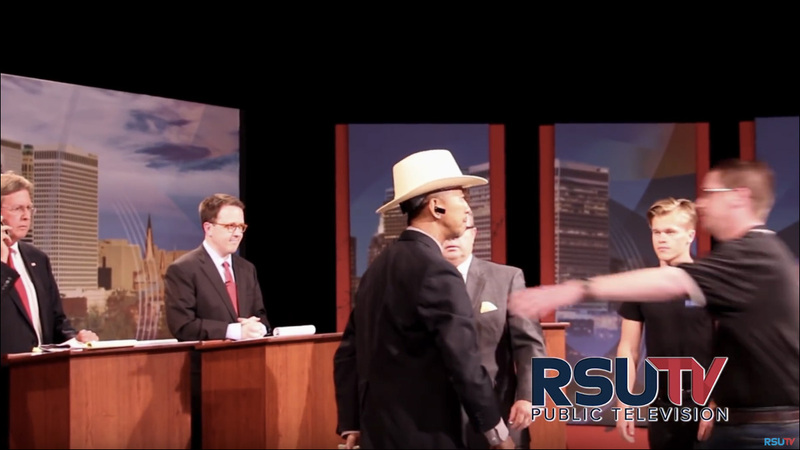 Last week in Oklahoma, things got heated during a mayoral candidate debate in Tulsa when an uninvited candidate crashed the proceedings on live television. 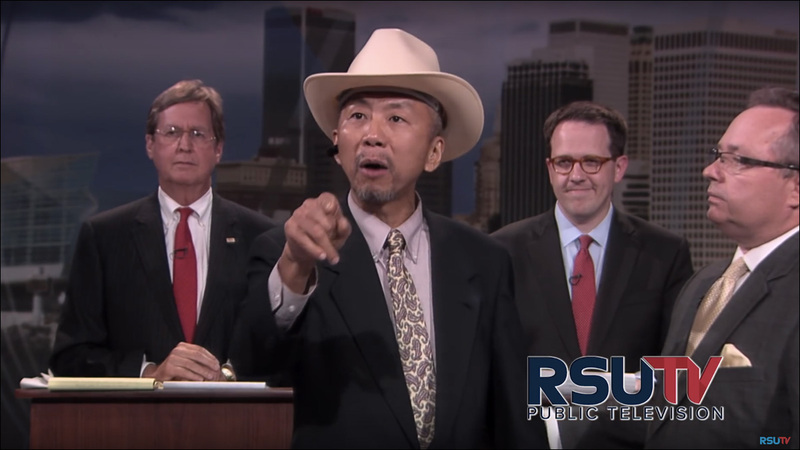 On Wednesday night, perennial Tulsa mayoral candidate Paul Tay interrupted a live public television broadcast debate between incumbent Dewey Bartlett and challenger G.T. Bynum at Rogers State University. As closing statements were about to begin, Tay stepped in front of TV cameras, introduced himself as also a candidate and said that "other voices" were being silenced. He was then asked to step off the stage. "I will not step off. I WILL NOT STEP OFF!" he said. "You have blocked me one too many times. You have blocked me. You have blocked other candidates one too many times. I'm tired of it." The outburst quickly devolved into an unintentional comedy sketch featuring an Asian man in a cowboy hat, the mayor calling 911 on his cell phone and, um, Matt Damon, sort of, entering the fray. The incident ended with Tay leaving the stage soon after the RSU broadcast was cut off. Only candidates with 10 percent of the vote in a recent poll were invited to the debate, and Tay only received 1.6 percent. It should be noted that Tay has unsuccessfully run for office in Tulsa six times since 2002. Before this incident, I had never heard of Paul Tay. I still know pretty much nothing about him or his platform or what he stands for. 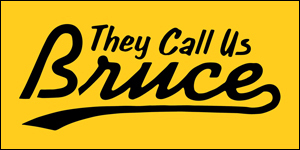 But you have to at least admire the gusto it takes to bust up a political debate on live television, even if it is local access television. (Somebody should really look into the security standards at RSU-TV.) 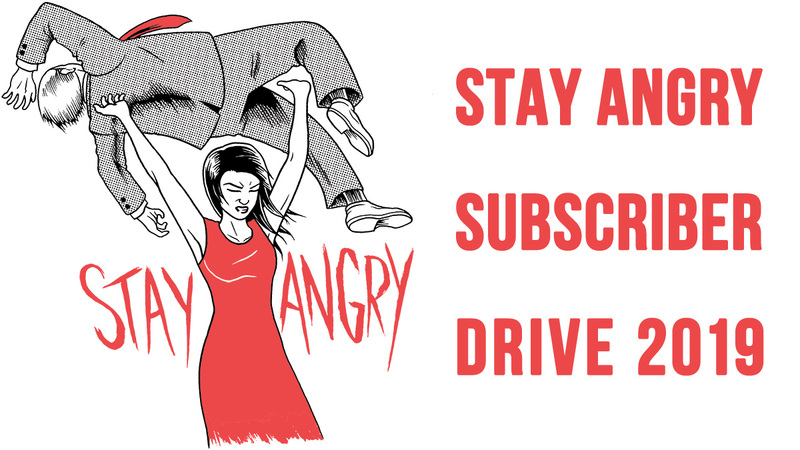 Clearly, Tay is operating under an any-publicity-is-good-campaign strategy. But let's be honest, the real star to emerge out of this now-viral disruption is cameraman Lars Lindtner, the young Matt Damon lookalike that Tay calls out as he's about to be escorted off stage. He really does look like Matt Damon.